House Speaker Nancy Pelosi was just about to fly overseas on a fancy trip to Belgium, Afghanistan, and Egypt until she got the bad news from President Donald Trump. There’s speculation that this might be Trump’s retaliation against Pelosi for trying to delay the State of the Union. But, one thing is for sure, he is getting the last laugh. Much to the House Speaker’s dismay, President Trump denied Pelosi’s military aircraft, effectively canceling her entire overseas trip at the very last second. She had recently made an attempt to delay the SOTU until after government reopens, but it seems Trump just got the last laugh as he canceled her trip, stating that she might want to be around for negotiations and they’ll delay rescheduling her fancy taxpayer-funded trip until after the government reopens. Trump played Pelosi at her own game, canceling events and referencing the shutdown. At some point, Trump and the Democrats need to reopen the federal government so that the 800,000 furloughed workers can return to their job and support their family. Democrats are proving to be a roadblock since they refuse to provide President Trump with funding for the border wall. The president possibly showed his sense of humor by waiting to announce he was pulling the plug on her aircraft and canceling the trip until Pelosi was about to the leave, according to Fox News. It’s not clear at what point her aircraft was scheduled to take off, but Sanders released Trump’s letter of cancellation at 2:12 PM EST. His letter suggests that Pelosi should be in town to negotiate, not overseas where she is unable to work towards reopening the government and restoring 800,000 employees back to work — and, of course, funding border security. “Obviously, if you would like to make your journey by flying commercial, that would certainly be your prerogative,” Trump’s letter stated, likely in jest, suggesting that the government wasn’t paying for her trip while they were in a shutdown. 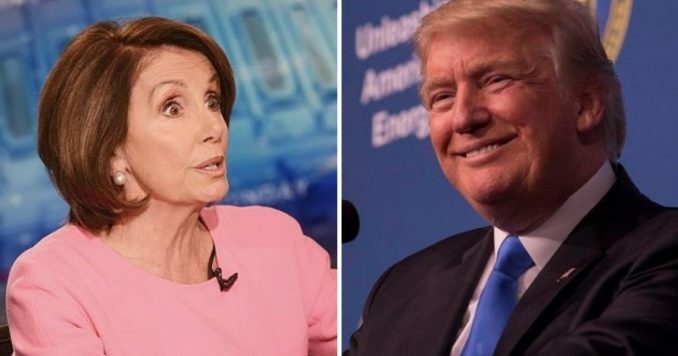 ABC News reported that Trump and Pelosi haven’t spoken directly since leaving a meeting on the 9th of January when Trump and Democrat leaders were unable to come to an agreement. Trump blasted that meeting as “a total waste of time” as they accomplished absolutely nothing. They may not have spoken directly, but Pelosi surely received a blunt message today. It’s one thing to spend your own money to go on a trip while the government is shut down, but to expect the government to pay your expenses to fly overseas while 800,000 people are out of work is absolutely ridiculous. Government officials must remain in action and working towards a solution that grants Americans safety at the border. President Donald Trump demands a safe border, which is something that numerous top Democrats have called for over the years. People like Bill Clinton, Hillary Clinton, and Barack Obama had consistently called for border security and immigration reform, and it wasn’t a huge problem for Democrats back then. But, all of a sudden Donald Trump repeats some of the same agenda, wanting safety for Americans from violent illegal alien criminals, and he’s the one taking the brunt of the criticism. Are Democrats acting in poor faith simply to object to anything the Trump administration puts forward? It sure seems that way. It doesn’t matter what Trump does, the left will speak against it because they despise him and are still upset that he defeated Hillary in 2016. They are learning the hard way, Trump is used to winning. And, he always gets the last laugh.